What will 2018 have in store for Dana Point Harbor revitalization and fishing license reform? STATEWIDE — The time of making resolutions and looking ahead to what could be is upon us, meaning it’s also a great opportunity to review the year we just experienced. The Log covered a wide variety of news topics in 2017, ranging from everyday boating policy decisions to broad environmental stories. We also reported or discussed boat bottom copper paints, fishing policy, sea level rise, waterfront redevelopment projects, personal watercrafts, plastic pollution, climate change, desalination, governance of local marinas, charter services, invasive plants, ethanol, moorings, sea lions, boat launch ramps, Pacific bluefin tuna and the future of Division of Boating and Waterways. Our final issue of 2017 takes a quick look at some of the most notable stories of the past 12 months. One of the largest swaths of undeveloped coastal land in Orange County was at the heart of a major California Coastal Commission decision at the outset of 2017. The California Coastal Commission rejected a proposal to redevelop about 401 acres of open space at Newport Beach’s Banning Ranch in February. It was a major win for environmental advocacy groups who opposed the addition of 900 homes, hotel and hostel facilities, and more than 45,000 acres of retail space just off central Orange County’s coast. The quasi-judicial agency’s decision was considered a litmus test of whether the California Coastal Commission would favor corporate interests after dismissing its executive director, an environmental advocate, about one year earlier. Newport Beach, nearly 10 months after the commission’s decision, voted to cancel its contracts with the Banning Ranch developer. The future of Banning Ranch is still undetermined. The Coastal Commission’s search for a new Executive Director coincided with its Banning Ranch decision. Jack Ainsworth was selected as the commission’s fifth top executive, exactly one year after commissioners controversially fired his predecessor, Charles Lester. Five candidates were vetted from 13 applications received; the names of the candidates were not revealed. Lester, a staunch advocate for environmental issues, was relieved from his executive role in February 2016. The commission’s 7-5 vote in favor of dismissing Lester was juxtaposed with widespread public support for the former executive director. The firing of Lester caused some observers of the Coastal Commission to question whether it would become beholden to pro-development interests. The Environmental Protection Agency (EPA) was also under the microscope in 2017, particularly with its mandate on ethanol production. Boating United, a pro-boater advocacy group, launched a petition to urge Donald Trump, who was President-elect at the time, to reduce corn-based fuel mandates as soon as he assumed the presidency. A joint letter penned by BoatUS and National Marine Manufacturers Association (NMMA) in May urged Pres. Trump to reform the Renewable Fuel Standard and limit the national supply of ethanol. The EPA ultimately decided to increase ethanol’s supply, certainly to the disappointment of boating interests. Groups such as BoatUS and NMMA have long stated fuel blends containing 15 percent ethanol or greater are harmful to marine engines. A federal bill (H.R. 861) proposing to eliminate the EPA altogether was filed not long after Boating United’s ethanol petition. Florida Rep. Matt Gaetz introduced H.R. 861 in February. Abolishing the EPA was necessary to protect states rights, according to Gaetz and the bill’s other sponsors. H.R. 861 circulated in a few House committees but hasn’t been deliberated in any capacity since April. A San Francisco legislator took aim at second residence owners at the end of 2016, proposing the elimination of certain mortgage deductions via Assembly Bill 71 (AB 71). The bill specifically would have required taxes on second residence mortgages be paid to help fund California’s affordable housing initiatives. Certain boats fell within the definition of a second residence, meaning some boat owners would have been exposed to increased tax payments had AB 71 been enacted. The bill didn’t make much progress in 2017, but AB 71 is still on the docket for 2018. A tax reform bill approved in the House of Representatives in November also proposed the elimination of second resident deductions at the federal level. State Sen. Tom Berryhill, R-Twain Harte, introduced Senate Bill 187 (SB 187) earlier this year, hoping his proposal for fishing license reform would finally garner the approval of his colleagues and the signature of Gov. Jerry Brown after previous attempts failed. The bill specifically proposed to eliminate California’s calendar-based fishing license system and replace it with a 12-month scheme. SB 187 moved through the State Senate and a handful of Assembly committees with no opposition. No formal oppositions were filed against SB 187 by lobbyists or other interests. Yet the bill still failed to advance out of the Assembly Appropriations Committee, leaving SB 187’s sponsors and supporters wondering why an unopposed proposal calling for common sense reform stalled in the late stages of the legislative process. Federal officials rejected a formal request to declare Pacific bluefin tuna as an endangered species. The decision, which was handed down in August, completed a one-year review of the bluefin tuna fishery. Officials with the National Oceanic and Atmospheric Association (NOAA) stated the Pacific bluefin tuna population was stable enough as to not warrant restrictive protection of the species under federal law. Regulating charter operations in Southern California harbors was a hot topic in 2017, with the issue discussed by the Division of Boating and Waterways Commission, L.A. County’s Department of Beaches and Harbors, U.S. Coast Guard, city of Newport Beach and various agencies and entities in San Diego. Los Angeles County’s Small Craft Harbor Commission, which recommends policy actions for Marina del Rey, has been trying to craft an illegal charter operations action plan for some time now. Deliberations on the matter will continue into 2018. Newport Beach’s City Council also discussed passenger charter operations at their final meeting of 2017. The council pushed its discussion on the matter into 2018, as well. A coalition of agencies and entities in San Diego, including the Coast Guard and Port of San Diego, have also been working toward crafting a set of policies to govern illegal charter operations. It’s been an interesting year for Dana Point Harbor, the South Orange County waterfront and boating destination pegged for redevelopment since 1997. Orange County Auditor-Controller Eric Woolery released three audit reports on Dana Point Harbor operations. The reports, for the most part, found “management control” of critical harbor operations. Dana Point Harbor also welcomed a new manager, as Shannon Levine was plucked from Newport Beach to essentially succeed Brad Gross as the waterfront’s chief liaison to Orange County. County officials planned to launch a Dana Point Harbor Advisory Commission, with two of the panel’s 11 seats filled in August. Weeks later the commission was dissolved – after nearly one year of planning and discussions. The Board of Supervisors entering into negotiations with a group of private firms to oversee Dana Point’s revitalization followed the dissolution of the advisory commission. Jenny and Russell Armstrong have been at odds with the city of Avalon throughout 2017, as both parties struggled to come to terms to execute plans for a new café at the local fuel dock. The Armstrongs hoped to build a café at the city’s fuel dock and thought they had a path to realize their plans coming into 2017; the couple had operated Casino Dock Café in the same area for about 20 years and initially agreed to construct a new eatery. However both sides failed to reach a final consensus. Avalon, with no success to date, has solicited proposals from other potential vendors. The future of a new café at Avalon’s fuel dock remains uncertain. Thrill seekers suffered a loss in mid-February when Newport Beach’s City Council opted to ban jetpack activities from the local harbor. 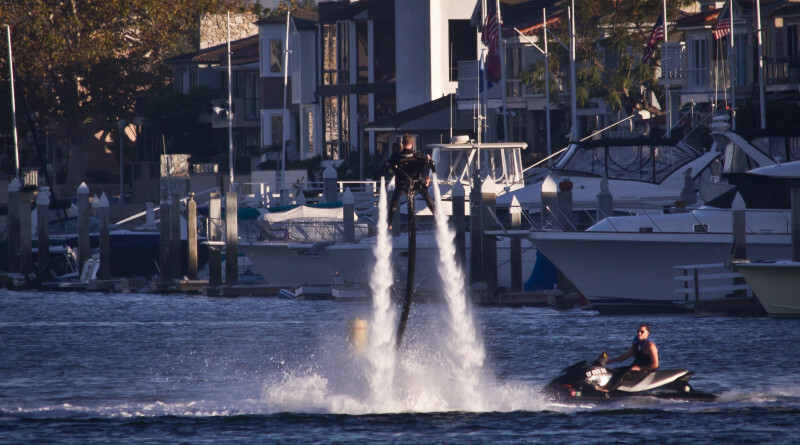 Jetpack operations in Newport Harbor met with controversy ever since the activity was introduced within city limits. A contingency of waterfront residents opposed any jetpack activity within the harbor, claiming it was loud and unsafe. Supporters said jetpack operations were actually safe and would draw tourists to Newport Beach. Participation of two well-known sailing events in Southern California hasn’t been high in recent years, leading Newport Ocean Sailing Association (NOSA) to acquire The Border Run and manage it alongside its other race, Newport-To-Ensenada (N2E). NOSA hopes to consolidation of both events under one roof will help the organization better position The Border Run and N2E to sailors of all ages, ergo increasing participation. The International Olympic Committee finally announced the Summer Games hosts for 2024 and 2028. Southern California will host the Summer Olympics for a third time in 2028. Sailing events would likely be held at Long Beach, just as they were in 1932 and 1984. Details of the Games will be revealed in the coming years.